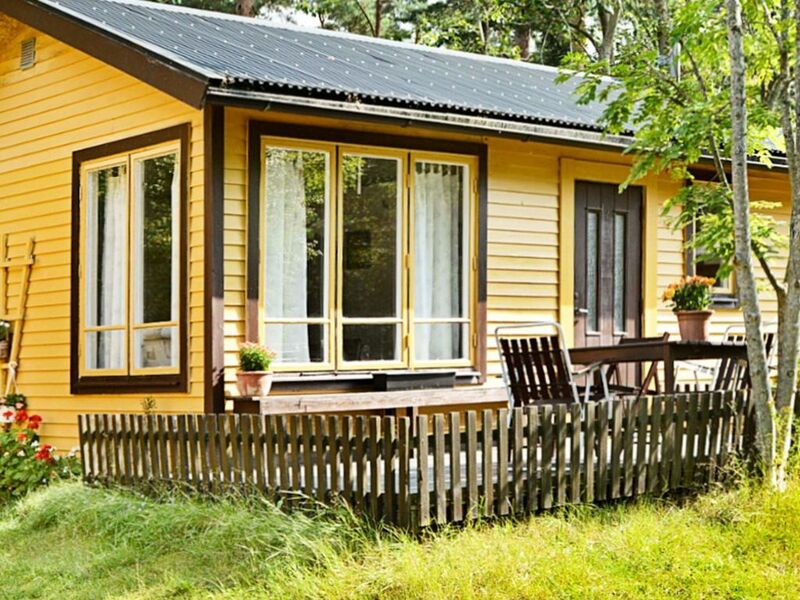 This lovely little holiday home is situated on Oknö, between Kalmar and Västervik. The cottage is open-plan and features a small kitchen area with the basic amenities, and a living room with an open fireplace and a TV with parabole channels. The bedroom is equipped with two bunk beds and sleeps a total of four people. You enter the bathroom from the outside of the house, it is equipped with a WC and a washbasin. The shower is in the annex. The living room opens onto a terrace with outdoor furniture and a garden grill. The cottage is set on a natural garden plot and the owners live in the house next door. There's also a SPA 200 metres from the house. The cottage is within driving distance of a number of charming towns and tourist attractions, such as the island of Öland and the town of Kalmar. The children will really enjoy Astrid Lindgren's World in Vimmerby. Katthult and Bullerbyn, well known from Astrid Lindgren's beloved children's books, are also close. Or why not take a daytrip to Mariannelund and find out how sweets were made in the olden days? The Kingdom of Crystal, Glasriket, is another interesting destination. This is where the famous Kosta Boda glass is made. Västervik is also well worth a visit, offering shopping, beaches, folk music, and many events. You can rent bedlinen for 150 SEK/ person. A final cleaning service is included in the rent, so that you don't have to worry about cleaning after your relaxing holiday. The owner of the house won't charge a fee for electricity during July and August. Welcome to the beautiful east coast!